Even though Major League Baseball will be fully underway this week, the National Football League continues to make headlines with free agent signings and the upcoming draft. This morning, Nike kept pro football on sports fans minds by unveiling the new jerseys for the 2012 season. Most teams look has stayed consistent with years past, but the Seattle Seahawks received the largest overhaul to their uniforms. 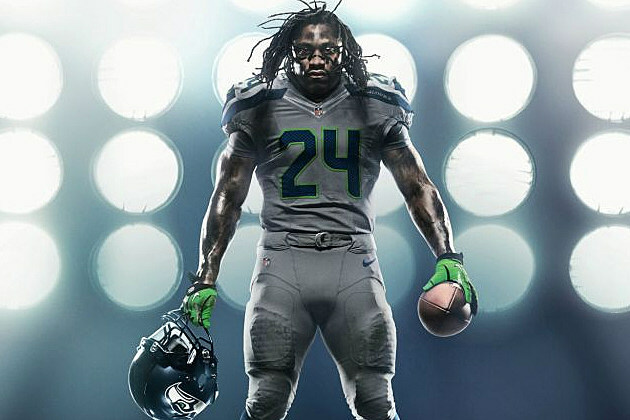 The new Nike Elite 51 Uniform will be worn by each of the 32 NFL teams. This includes every aspect of the uniform from the helmet to the socks, and even added an aircraft-grade aluminum D-ring belt to reduce weight. That might be a little drastic, but according to Nike 'Fast Is Faster'. There were pictures released last year showing a drastic change to the look of almost every NFL team, but those NFL Blitz looking jerseys were actually fake. Luckily the league and Nike didn't go the route of those and kept drastic changes . If you don't need the latest and greatest, brand new jerseys means that last years jerseys have dropped in price. Replicas are only $50 and Authentic jerseys are down from $300 to about $150 on NFLShop.com. The Seattle Seahawks have chosen to take full innovation and a completely new re-design for the new Nike Elite 51 Uniform. The core uniform design looks back at Northwest tradition and culture with a Native American heritage. The team’s logo – a striking seahawk bird taken from Native American culture provides a focal point of both the uniform and helmet. At the top of the helmet a new pattern gives a nod to Seattle’s loyal, passionate fans. The horizontal graphic stripe across the front of the shoulders replicates the powerful horizontal seahawk wings carved into the wooden poles, while the same pointed wing pattern lives on the outside of each leg, with twelve wing icons to each side. The new uniform colors are rooted in Seattle’s own environmental hues - the deep blue of the ocean water that tucks into the harbor near downtown and the Seahawks’ stadium. The new color addition called Action Green represents the green of the ubiquitous trees, ferns and moss literally covering the Pacific Northwest landscape. This brighter shade of green is designed to provide a pop of color on the uniform just as the vibrant bright greens pop in the rain-soaked environment. The Wolf Grey color accents complete the combination, an embodiment of the ever-changing clouds overhead that bring rain and life to the area. Lastly, bright white accents the uniform just as the snow capped peaks of the Olympic and Mt. Rainier accent the skyline around Seattle. The native influence goes all the way into the numbers, which are shaped with the same straights edges and curves as the stoic hawks that reign atop the tallest totem poles. In addition to these new design elements, the Nike Elite 51 uniform features Flywire technology to reduce weight and provide a lockdown fit over the pads. The uniform is completely engineered from the inside out, focusing on creating a system where the baselayer, padding, jersey and pant work in concert. A few of the new innovations include increasing sleeve articulation for better range of motion and integrating new four-way stretch fabrication to provide a streamlined shrink-wrap fit. In addition to serving as Seattle’s on-field supplier for uniforms, sideline apparel, practice wear and baselayer, Nike will also provide men’s and women’s fan wear apparel. Athletes will also be able to wear the Nike Vapor Jet 2.0 Glove featuring the interlocking team logo on the palms. ZONED STRENGTH - High tenacity, stretch material, for lightweight lockdown strength. CUT FOR MOBILITY – Four-way stretch, hydrophobic materials enable range of motion wet or dry. CUSTOMIZABLE BASELAYER PADDING – Nike Pro Combat Hyperstrong baselayer with integrated lightweight, Deflex padding offering customizable flexible protection. ALUMINUM D-RING BELT - Aircraft-grade aluminum D-ring belt reduces weight.